This rather large Pillory is 42" wide, 12" tall, and 2-1/4" thick. The halves slide together vertically on internal rails, and the eyebolts pivot freely. It's constructed from 3/4" Furniture-grade plywood. It weighs a massive 20 lbs. 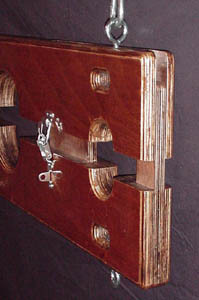 The neck hole is 5-1/2" x 6", and the wrist openings are 2-1/2" x 2-3/4". The wrist holes are spaced from the neck 16" on center, so that the occupant's forearms are more or less straight. The draw catches have provisions for padlocks, and all edges are rounded with a 1/2" radius. By the way, it is entirely possible to put yourself into these and get out solo. Colors: Clear Poly, Black, Gray, White and Red.